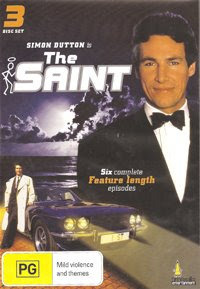 Umbrella Entertainment have finally released the 1989 The Saint series on DVD. Now this series isn’t particularly good, unsure of whether it’s a comedy, or a gritty crime series. Thankfully this entry brings back some of the jet-setting glamour that was missing from other episodes. The Blue Dulac is set in France and features some grand homes and architecture. It at least looks like Simon Templar is living the high-life; rather than just being an average Joe with a penchant for theft and beautiful women. The film opens in France. A young couple, Jack and Christine Coultar return to their palatial home only to find that is has been trashed. Red spray paint has been used on the painted art, walls and furniture; and all the mirrors, statues and vases have been shattered. The curtains and drapery have been shredded. The door to the safe lies open. Inside is a note saying that next time they come back when Christine is at home. Jack closes the door to the safe, but it has been wired to a bomb. The house is blown up and Jack and Christine killed. The man that police believe is behind the atrocity is George La Force (John Astin – but he’ll always be Gomez Adams to me). La Force is a big time gangster who blows up anyone or anything that stands in his way. La Force looks like he’ll be brought to trial for the murder of Jack and Christine, but at the last minute, the Judge decides not to proceed with the case due to a lack of evidence. In fact though, La Force had a team of thugs hold the Judge’s family held at gunpoint. If the Judge had proceeded, La Force would have killed his family. As so often happens in these Saintly adventures, Jack and Christine were friends with Simon Templar (Simon Dutton) AKA: The Saint. It is not long before The Saint is in France and attempting to bring down La Force’s empire of evil. La Force has one weakness which Templar plans to exploit – it is a fondness, verging on obsession, for sapphires. Posing as a jewel thief named Lamont, Templar intends to steal The Blue Dulac, a priceless sapphire necklace, and apportion the blame to La Force. Simon Dutton, as always, cuts a fine figure as The Saint. His hairstyle may have dated slightly, but he certainly isn’t painful to watch, unlike some of the actors and actresses in this show. For my mind, The Blue Dulac is a step up from The Software Murders (but that isn’t hard), but it is hardly core Saint material. If you’re a fan of The Saint then this maybe worth a look just to tick it off your list, but other than that I’d probably give it a miss. The Simon Dutton Saint TV movies are available from Umbrella Entertainment in Australia.